Whew, we survived January. I am still on that vitamin C train though. 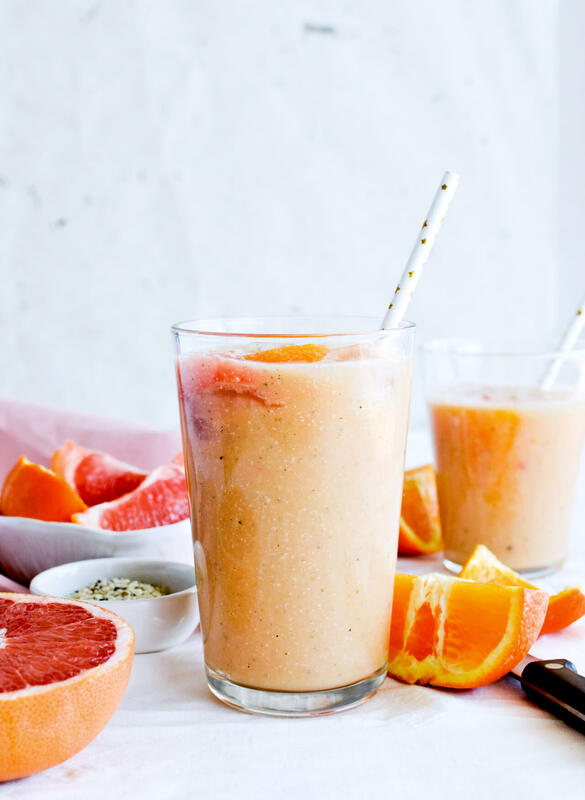 My fresh ginger chamomile tea is still on the menu, as is this vitamin c citrus power smoothie. It’s an old favorite, but I thought I’d be good to pull it out, dust it off, show it again, because you guys might need it! This may be silly, but whenever I think of this smoothie, Pump It by Black Eyed Peas starts playing in my head. Does anyone remember that song? Maybe it’s just the Misirlou sample (from Pulp Fiction) that hits me, but either way… it’s on my mind like all the time now. And honestly, the anticipation alone of knowing I’m about to drink something so refreshing makes me feel energized already. 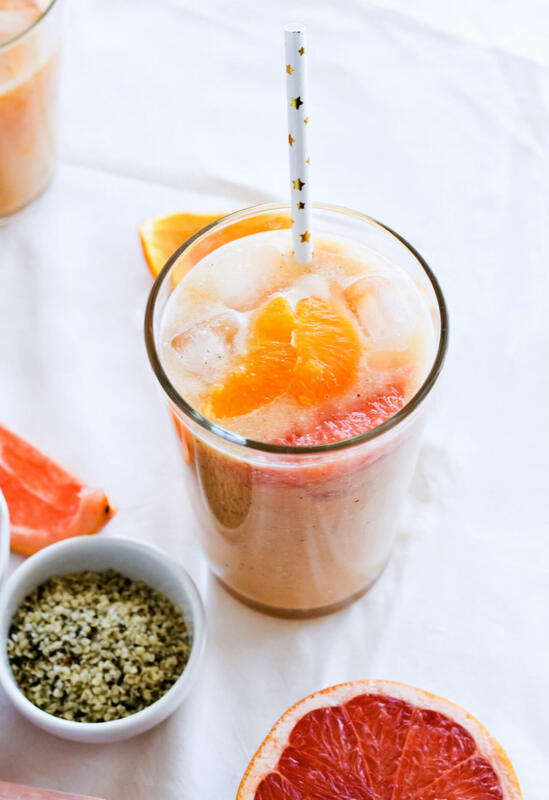 You know I keep calling this drink a smoothie, the vitamin c citrus power smoothie. 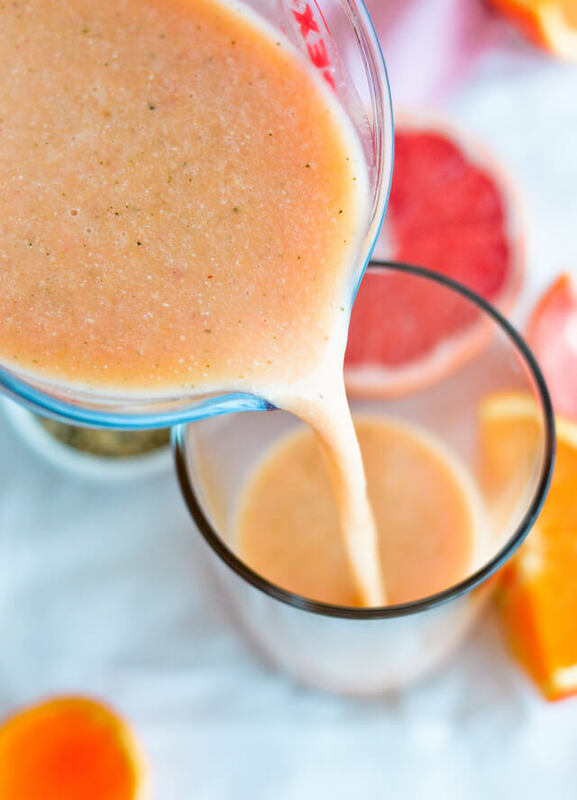 And it is essentially a smoothie, but it’s so light and made with so much citrus juice that it’s more a juice than a smoothie. I’m really taking advantage of all the citrus that winter has to offer. How could I not? One step into the produce aisle and the gorgeous yellow, orange, sunset hued fruits just call my name. 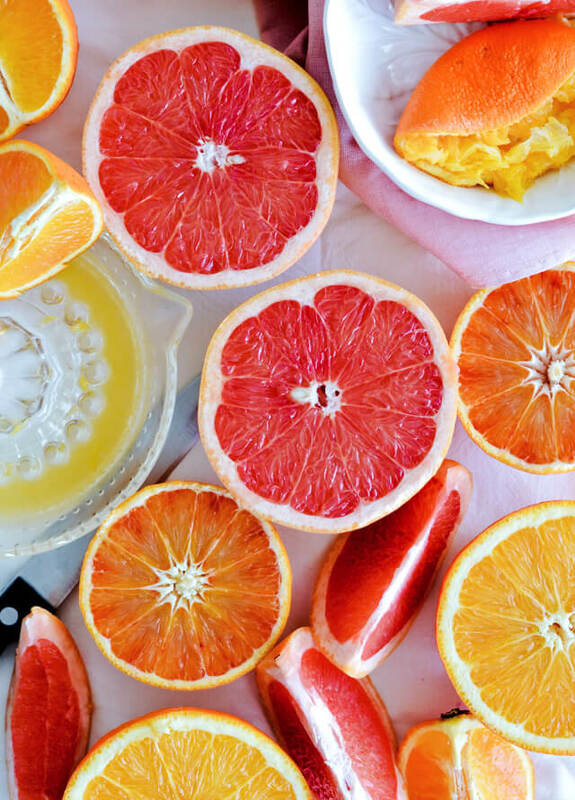 They are as vibrant in appearance as they are in taste and I dream of tart grapefruits, sweet oranges and perfumy tangerines on a daily basis. 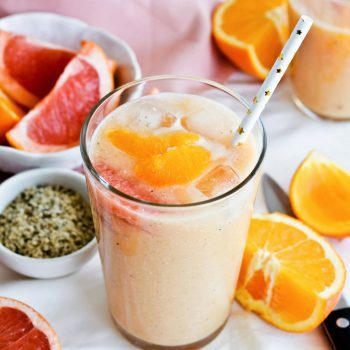 This vitamin c citrus power smoothie combines some of these flavors, but you can always experiment and add more types of citrus or simply use whatever you have on hand. I add a frozen banana to this, a small splash of vanilla extract, some hemp hearts and plant milk. My current flavor right now is rice-coconut which works soooo amazingly well with the citrus, but you could definitely use a different type. 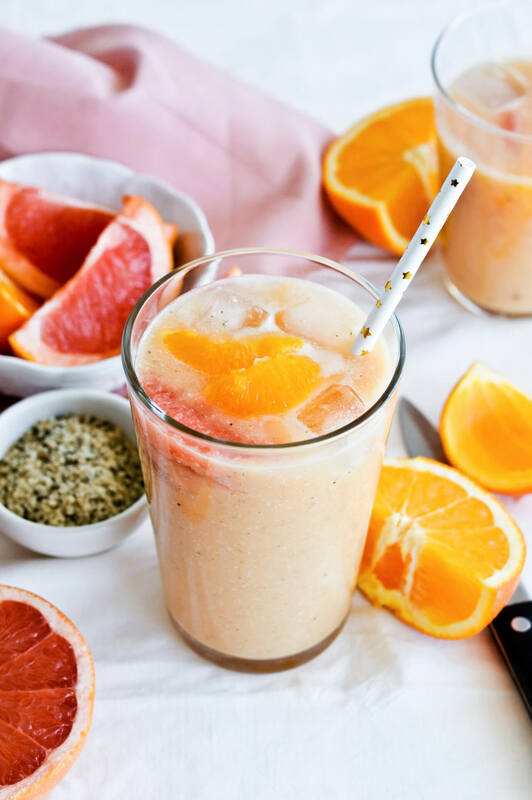 I can promise you right now you’ll feel so amazing once you drink this Vitamin C Citrus power smoothie. At least I do. Recipe makes one large smoothie (about 500ml | 1 pint | 2 cups in size). Combine all ingredients in a blender and blend on high until the mixture is completely smooth, about a minute. Taste to see if you want anything else, then pour in a glass and enjoy! The full amount of all the juices combined was about 400ml (1 2/3 cups) and the end size of the smoothie was about 500ml (1 pint). 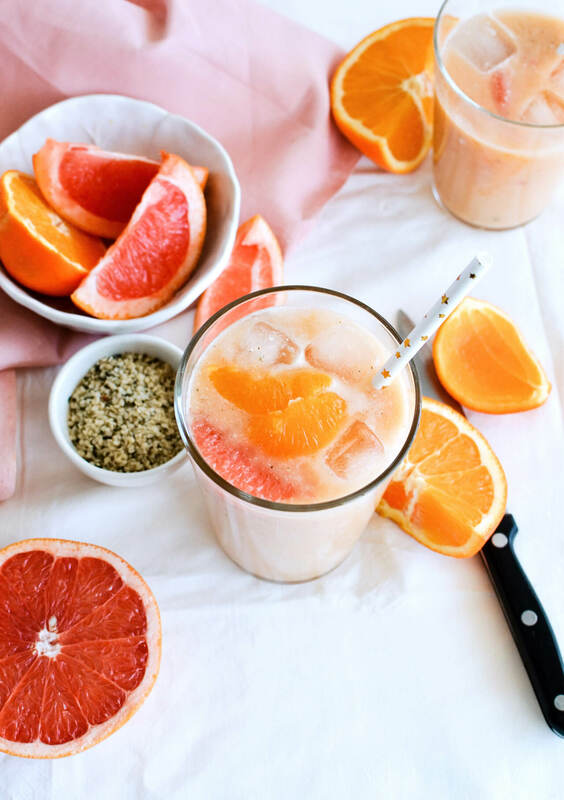 This smoothie is only naturally sweetened, but if you find the grapefruit to be super bitter and overpowering you can add maple syrup, agave syrup or similar to the smoothie. Disclaimer: Recipe first published in January 2016, updated in February 2018. Yum! 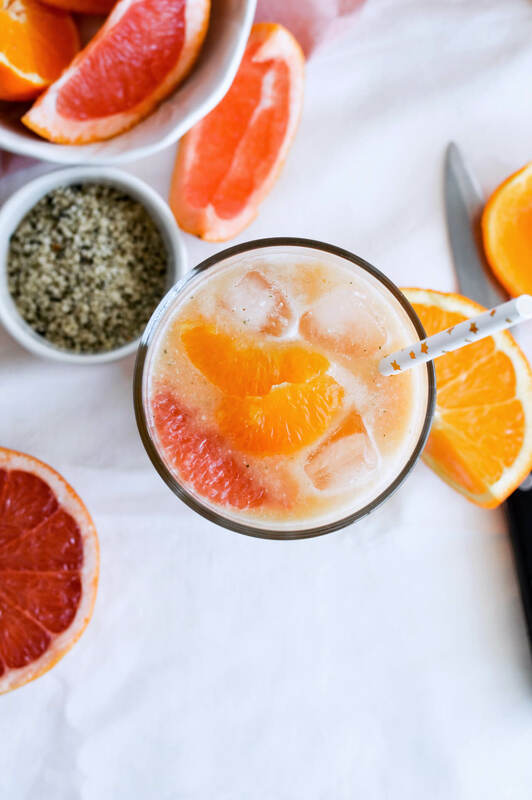 I’ve been increasing my vitamin C intake lately, and this is such a wonderful way to do so! Thanks!